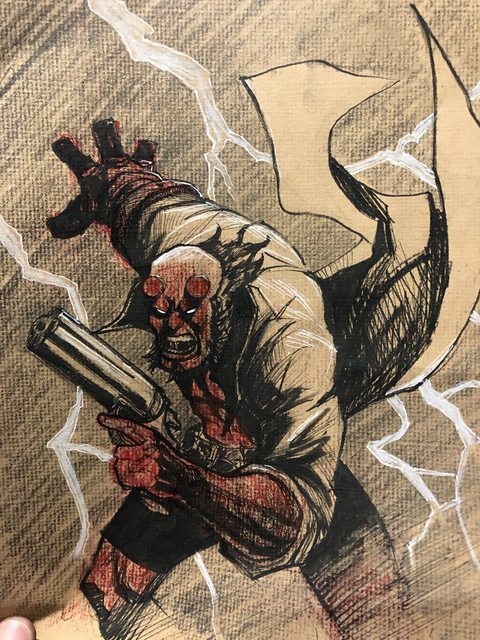 ART CLASH WEEK 15: DRAW YOUR OWN VERSION OF A HELLBOY IMAGE!!! › Forums › THE ART CLASH 2.0 › ART CLASH WEEK 15: DRAW YOUR OWN VERSION OF A HELLBOY IMAGE!!! Whose Hellboy will bring the Right Hand of Doom on his foes? This topic contains 19 replies, has 5 voices, and was last updated by Newbold 6 days, 3 hours ago. Draw your own take on any of the Hellboy images attached below. 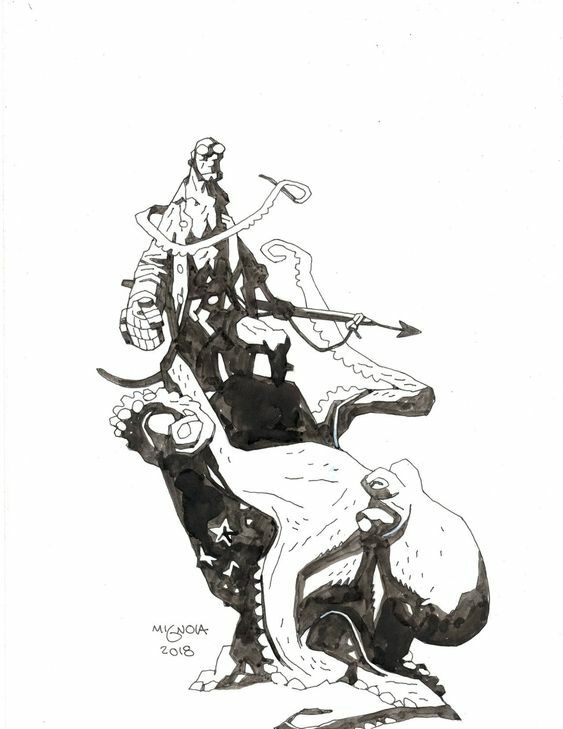 CONCEPT: Mike Mignola is amazingly talented at creating and composing images. Using any of the below images for a starting point, recreate it in your own style. Be sure to pay attention to what works and what doesn’t and try to arrange the elements on the page as effectively as he does. I can’t wait! I have one question, I’ve never seen a picture of Hell Boy smiling. What’s up with that? I did this in around an hour. I’m fine with anything you guys say, I just want to draw. Joe! It’s so good to see you again!! One thing that REALLY popped out to me was his coat! How it’s all over the place and filled with action! That’s something comics lack these days, action. It’s what made the older comics look and feel amazing. And you nailed it this week! Brett – I really love the attention to detail in his utility belt – the best part of this is rasputin’s expression he looks seriously enraged while hellboy looks calm and almost annoyed. The juxtaposition of their moods makes things very interesting. My only suggestion for improvement is to further push the size difference between the 2 characters making hellboy smaller and rasputin larger might give an even more ominous feeling. Got my vote. Knight – really impressed that you not only did a full background but also did full color! You really did a great job of setting the creepy mood and the shadows on hellboy’s face and hand really help to create depth. steel – HOLY COW! Only and hour??? that is crazy fast for this finished of a piece. It is very clean and you are placing shadows in a very purposeful way. I especially like the way your blacks design the page and guide the viewers eye. this was a really fun challenge – cant wait for the next one!!! nice work Joe! thanks for the feedback!